If the company specializes in industrial robotics has remained true to its local market, Socabelec also wishes to take advantage of the global industry expertise in the glass industry nurtured for over 50 years in the heart of the Silica Valley. Building on its past experiences in Africa and Latin America, Socabelec today is known internationally for its sophisticated and diversified skills in all areas of glass and industry. 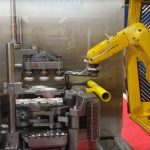 Its Swabbing Robot, major innovation in the sector of the production of glass bottles, is already exporting around the world: several robots are active in the Netherlands, the United States and other robots are fully operational in Germany. The area of production of glass containers can now enjoy the precious knowledge without compromise offered by the latest innovation from Socabelec. Besides a large impact on the international scene in the glass world, Socabelec is primarily an innovative company with a vision on the future of the industry. Today, the goal is Socabelec to implement this vision by working hand in hand with the global industry through the creation of new technological and innovative tools. Like Ardagh Group, first company to talk about his desire to eliminate the work of manual lubrication (swabbing), any manufacturer can find a concrete technological answer to Socabelec. You want to develop an innovative solution for your industry?